Guest blog post by Dalila Benachenhou, originally posted here. Dalila is Professor at George Washington University. In this article, benchmarks were computed on a specific data set, for Geico Calls Prediction, comparing Random Forests, Neural Networks, SVM, FDA, K Nearest Neighbors, C5.0 (Decision Trees), Logistic Regression, and Cart. LR_new_predictors are predictors for Logistic Regression. We used LR_new_predictors for both Logistic Regression, Random Forest, and K Nearest Neighbors. Variables starting with z are at least scaled to 0 and 1 if they were discrete variables, or normalized scaled and centered, if they were continuous. Variables starting with c are the categorical form of the original variables. We decided on their number of levels by the significance of their odd ratios. We decided to combine day15 and day16. From this combination, we split our dataset into Training set (80%), and Validation set (1/3 of 20%) , and Testing Set (2/3 of 20%). Due to the extreme class imbalance, we decided to use F1 Score to measure the models performance, and try 4 approaches to model building. In the first approach, we used down sampling during model building, and found the maximum threshold with the validation set. We set the threshold to be the point where Sensitivity (Predict) and Positive Predictive Value (Recall) are highest in the ROC curve. In the second approach, we down sampled during training phase, and tuned the models with a utility function during the validation phase. In the third approach, we built a C5.0 model with cost, and a Random Forest with a prior class probability and a utility function. In the fourth, and last, approach, we combined the models to create an "ensemble". 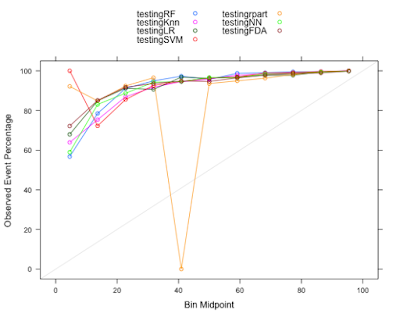 For predictive models, in addition to Random Forest, and C5.0, we built a Neural Network, a Support Vector Machine with Radial Function, a K Nearest Neighbors, a Logistic Regression, a Flexible Discriminant Analysis (FDA) and a CART model. Many of you will be wondering why we have Random Forest. In the previous blog, we provided raw predictors to the Random Forest. In here, we provide the LR_new_predictors to the Random Forest. We want to see if pre-processed predictors result in a higher Random Forest performance. Except for Age and Tenure, the new_predictors are mostly categorical variables. From the Calibration plot, except for CART (rpart package used), all the other models had good calibration and good performance. In addition to this, we also used utility functions to improve Random Forest, Neural Network, SVM, and K Nearest Neighbors. In here we utilized down sampling, and then found a utility function using validation data set to tune our models. For C5.0 to work, we had to set up our cost for miss categorizing Yes to a high value 72, and we had to put a little cost for miss-classifying No. We also had to set Trial to 1, and winnow to FALSE. We could have improved C5.0 performance by using Monte Carlo to find the optimal cost values. No, and slightly the F1 Score for No. We will improve the Yes F1 Score, but we have a slight insignificant decrease in No F1 Score. For Yes Precision, the majority vote performance is lower only to Random Forest. For Yes Recall, the majority vote performance is lower than Random Forest and Neural Network Yes Recall. However, for No, the performance is higher only to Cart and Logistic Regression. In here, we have the get better prediction of the rarest event at the expense of the most common. A more sophisticated ensemble of all these predictive model will more likely produce better prediction that average. We created 22 models. Even though the classes were extremely imbalanced (96.2% vs. 3.8%), all the models performed well. We designed 4 type of experiments. The first approach required down sampling when building the model, and then finding the threshold from the validation set to optimize it. The second approach still required down sampling, but then finding a utility function from the validation set to improve the models. The third model used only prior probability of the classes and either cost matrix for C5.0, or a utility function for Random Forest. The final approach combines the predictions from the first approach. The first part of this blog - pre-processing predictors - can be found here, and has interesting visualizations. Thanks for the great overview, and multi-part story. But you guys are close second.